A visit to Hartford’s Bushnell this week offers an audience a thoroughly enjoyable evening. The authors have found all they needed for focus in the framework of a highly successful Whoopi Goldberg movie. 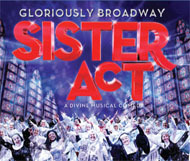 By adding an original score by multi-Academy, Grammy, and Golden Globe composer Alan Menken, with lyrics by Glen Slater, a ton of sequins and glitter, and a cast that knows how to deliver show-stoppers, “Sister Act” is ready for the big time. Heading the large and exuberant cast is Ta’Rea Campbell as Deloris Van Cartier, in an audience-pleasing rock ‘em, sock ‘em performance that is terrific. Hollis Resnik’s Mother Superior manages to bring some warmth and subtlety to a characterization that relies more on her delivery than to the material provided. Kingsley Leggs, as Curtis Jackson, contributes a healthy measure of laughter aided by Todd Horman, Ernie Pruneda and Charles Barksdale, as a trio of inept hoods. As Eddie Souther, E. Clayton Cornelius turns a bumbling, stumbling police officer into an instant hero. Lael Van Keuren, as postulant Mary Robert, has an endearing opportunity to shine in "The Life I Never Lived.” Each member of the chorus of nuns brings distinctive nuances to, what are intentionally, very broad and amusing character studies. A suggestion to the “Sister Act” sound technicians or the Bushnell’s own sound personnel – reduce the volume. Every number does not need to be transmitted at the highest level to the point that all singers sound like overpowering stereos instead of real people. Back to “Sister Act.” It’s strictly for laughs at a time in our lives when sharing a good laugh is something everyone can use.